Extracts From "'Just' Physiological Intonation"
Standard black tray jewel case with 10 page fold out booklet. © 1994 The Grey Area of Mute Records Ltd. Tracks 1 & 2 originally released as L.A.Y.L.A.H. Lay 13 March 1985. Also includes previously unreleased material. Track 4 has the note: "Originally recorded in 1954, modified in 1975." Track 8 has the note: "Originally bootlegged in Germany in 1982." A stunning collection of sound experiments although one needs to be relaxed and in the right mood, as this is definitely not made for the "easy listening" purpose. 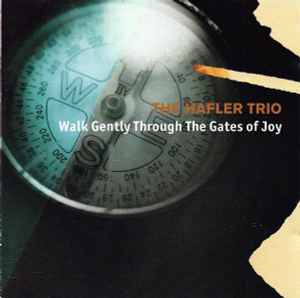 But once you are ready "Walk Gently Through the Gates Of Joy" will provide with a rewarding listen. Interesting detail about the very compact disc - the UK edition happens to feature the label printed in red/yellow/black (the same colour combination is featured on "Bang! An Open Letter"), instead of grey/white/black that is more properly in sync with the cover artwork. While it may indicate either the early edition of the disc or a possible colour "misprint", elsewhere online there are mere mentions of KUT 1 ("Bang! And Open Letter") and KUT 2 ("Walk Gently"), presented as sort-of a unified package, thus this identical labeling of the two may be the reason why both feature identical colouring on the disc label. Anyone out there knowing a bit more about this? Also there's slight distinction between the UK and the US editions' artwork (the UK edition includes some of the credits on the inner side of the 5-panel booklet, while the US edition omits these credits plus features the bolder Akzidenz Grotesk type on both, the spine and the disc. Also to differentiate between them, the UK version is a Mute release, the US version is a Soleilmoon release (although the US version also features the standard Mute logo on the rear cover and the CD).